New Haven's prime attraction is Yale University, over three centuries old, founded in 1701 and moved to New Haven in 1716. Yale University's campus in New Haven CT recalls England's Oxford University, for it's much more American Collegiate Gothic than, say, Harvard, which is mostly Georgian and Federal in style. Yale's got lots of open, grassy courts, and flèched towers. Centerpiece of this Collegiate Gothic world is Harkness Tower, inscribed with the famous motto that has for generations admonished Yale students to move ever upward: For God, For Country, and For Yale. 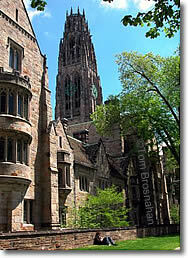 Harkness Tower has a carillon, which is played daily throughout the academic year. You can also see the art galleries, the Beinecke Rare Book Library, the Georgian-style Connecticut Hall, and the Gothic-style Sterling Memorial Library. Free personally guided tours also depart from the Mead Visitor Center weekdays at 10:30am and 2pm, weekends at 1:30pm. Free self-guided MP3 tours of the Yale campus are available in English, Spanish and Chinese, and start at the Mead Visitor Center. Bring your MP3 music player, tablet or smartphone.